Townsperson: Oh, he was a little guy... kinda funny lookin'. Townsperson: Oh, just in a general kinda way. — Fargo describes every character Steve Buscemi has ever played. 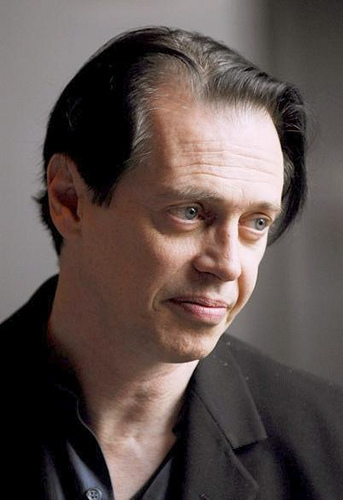 Steven Vincent "Steve" Buscemi (born December 13, 1957 in Brooklyn, NY) is a character actor beloved of The Coen Brothers, Adam Sandler, Quentin Tarantino, and anyone and anything related to the world of Independent cinema. In a career spanning over thirty years, Buscemi has carved himself a niche playing an assortment of freaks, losers, weirdos, creeps and psychos. It may be possible that his role as a man who gets fed through a woodchipper will have him forever pegged as that "kinda funny lookin'" guy. In addition to his work as an actor, he has also directed a number of feature films and several episodes of Homicide: Life on the Street, OZ, Nurse Jackie and The Sopranos, notably the celebrated "Pine Barrens" episode. Buscemi later stepped out of his "creepy weirdo" oeuvre to play the lead character Enoch "Nucky" Thompson in HBO's Prohibition Era drama Boardwalk Empire. Chronically Killed Actor: Especially in The Coen Brothers movies, and the brothers note that his remains get smaller and smaller through each film. Its Pronounced Tro Pay: He pronounces it as "boo-se-mee" and there's a lot of fans who say "boo-sheh-mee". His ancestral town of Sicily says "boo-shay-mee", which is closer to the latter's pronunciation. Jerkass: Most of the characters he plays. Jerkass Woobie: Invoked; many of his characters would be sympathetic if they weren't so unpleasant or ruthless. Lunatic Loophole: Armageddon, Con Air, Reservoir Dogs. How do you do, fellow tropers? TIL Steve Buscemi served as a firefighter during 9/11. Do you think God stays in Heaven because he too lives in fear of what he's created? Small Name, Big Ego: Many of his characters, but Fargo's Carl Showalter stands out. Armageddon finally let him play a character who really was as smart as he thought he was. Best shown in an episode of Homicide: Life on the Street where his character is a pretentious longshoreman with delusions of genius who talks down to the detectives whom he views as inferior. They bring in his copy of a Greek manuscript which he cannot read but which Pembleton, who's been playing thick in accordance with Buscemi's racism, can.